Chef Jeroen Bavelaar leads the classic French cuisine with an innovative twist and ingredients from the world cuisine. 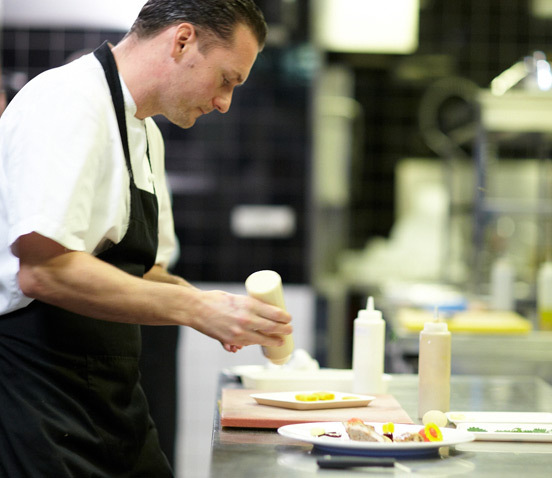 After working with the best Chefs in Holland he has developed his own vision and philosophy. Stubborn and meticulous about culinary details he strives for perfection every day to bring the best products to the table. Paired with exiting wines by sommelier and Patron Marc Boeljon. Despite our obsession for perfection Marc and his team want our guests to have a relaxing and enjoyable evening with staff that cares so their evening out will feel like coming home. Restaurant Posthoorn, part of Suitehotel Posthoorn, is located in one of the two adjoining 17th century buildings where you can feel the influence of prominent guests of the past like Queen Juliana, Admiral Dirksz, and Napoleon Bonaparte. One can feel the richness of the Golden Century with a stunning blend of modern design and a classical Dutch regency house with high ceilings and vintage decor. Since 2008 restaurant Posthoorn is honored with a Michelin star and belongs to one of the 100 culinary hotspots of the Netherlands.